English translation by Alisa Rethy. God has plunged us from the highest jubilation into the deepest sorrow. Never has a national sorrow been so deep and profound, and paired with such horror, as ours; for a horrible deed has been done, a deed blacker than the starless night and hatched in the deepest pits of hell. Abraham Lincoln, the beloved of his people, the savior of the fatherland, the liberator of millions of enslaved men, God’s anointed one has fallen by the hand of murder, by the hand of a man whose name will be the bane of centuries. Though so many tears have been shed in these four bloody years, they are but a drop in the sea of tears that now flows from the lifeblood of this great nation and surrounds the coffin being carried in Washington with the mortal remains of the best and noblest man. And when did he fall? At the height of his glory and splendor, at the very moment in which his great work was approaching completion with great strides, in which his mild pious heart pondered ways and means to heal the wounds the enemies of the fatherland inflicted upon the land and upon themselves – for he lovingly stretched out his fatherly arms to his murderers! A glittering celebration was already arranged and countless flame-tongues were set to proclaim our jubilation over the cessation of the turmoil of war and the optimistic hope for the restoration of peace – and now the country is clothed in sorrow and there is no jubilation, only broken hearts. The joy of our hearts is destroyed and our bliss turns to lamentation. The crown is fallen from our head . A sweet dawn broke before us, but with morning came the night, the night from which the most dreadful crime was born. How shall I console you when my heart is also broken? No! The time for consolation has not yet come; the wound is still too fresh to heal! Do not hold back your pain, release your grieving in full force for this enormous loss we have suffered! Indeed, our elders teach: one may not attempt to console anyone as long as the body of the loved one still appears before their eyes! But it is surely now the time to demonstrate the foolishness and reprehensibility of any mournful cry that we, in our justified pain, might want to direct against God’s government of the world. Even as our hearts break, our bravery in the fight for a sacred cause, our trust in the infinitely good leader of the history of all nations must remain whole and unshaken. Abraham Lincoln has fallen, but never was he lifted so high as in the moment of his fall. A life like his could not have found any more glorious conclusion. He was the messiah of his people, and far more glorious than the crown of love, with which this people adorned him, gleams the crown of martyrdom, placed by the enemies of the people upon his sunken, bloodied head. His lot has fallen in pleasant places . He was able to seal his immortal work with his blood, which ranks him even higher than Washington and will carry his luminous name through the centuries. And his sublime work – the overcoming of the rebellion and the defeat of slavery – has been in no way unsettled by his demise; rather, it has only been further strengthened. After this ghastly deed, which must open the eyes of even the most blind toward the boundless depravity of the slave drivers and their accomplices, a depravity which would even seek to kill an honorable old man on his sick-bed , after this ghastly deed – I say – there can no longer be parties at odds in the North. The murder of the high priest of freedom will and must unify all those who still carry a spark of moral feeling within them, unify them to an intimate brotherhood for the preservation of the republic and the eradication of this shameful institution. Those, too, who formerly misunderstood and vilified the glorified one and his world-historical feat must now learn to love and honor both the man and the deed. There is a profound meaning in the rabbinic saying: The death of the righteous procures atonement for the sins of the age. If Abraham Lincoln had a flaw, it was his excessive charity toward the rebels: he, whom the demagogues and the murderer decried as a tyrant! Moses sinned by striking the stone to give water to his thirsting people, though God had ordered him to speak to the stone. The reverse holds true in the case of Abraham Lincoln. He believed he could bow the stiff neck of the insurgents by speaking to them kindly and treating them gently, though this neck can only be bowed through the well-deserved discipline of blows. Yes, let there be mercy, charity, and all possible support for the misled people of the South! But for the leaders of the rebellion, whose hands are so horribly sullied with blood, who made hundreds of thousands widows and orphans, allowed our prisoners to starve in their cellars and, finally, took our adornment and crown from us – upon them be not revenge, but justice! Thus I call in the name of God, and thus also speak thousands, who have suddenly turned from roaring lions into cooing doves – and that, too, is a blessing that emerges from our pain. With this atrocity, the rebellion and slavery have reached the peak of their criminal lives, but upon that peak they have found their permanent grave. The beast, drunken with blood, has sunk its mangling, voracious fangs into the heart of the one who tamed it, but with this blood has only drunk itself to death, while its noble victim lives on, loved and blessed thousand fold in the memory of his people and in the memory of all of humanity. When Israel went forth from Egypt, it carried as a flaming victory banner before it the coffin which held the bones of Joseph, that righteous one, who through all manner of storms never strayed from God’s path. Joseph, a powerful leader, lovingly embraced those who betrayed him after they declared their remorse and, even in the hour of death, still proclaimed the ultimate redemption of his tribe with unshakeable confidence. As the Midrash aptly states: “the sea, which Israel crossed on dry land, parted before this coffin, before the sacred ashes, the national treasure.” And thus, too, will the sea of impermanence never be able to wash away the memory of Abraham Lincoln! In the most distant times the banner of freedom will still wave high and proud on his burial mound and spark courage in the fight against the enemies of freedom; still, in the farthest future, millions of pilgrims will surge there and say: here rests America’s pride and ornament, he who – like Moses – led his people through a long bleak desert to the border of Canaan, and was not permitted to enter! The fourth of July and the fifteenth of April are henceforth the two greatest days in American history. 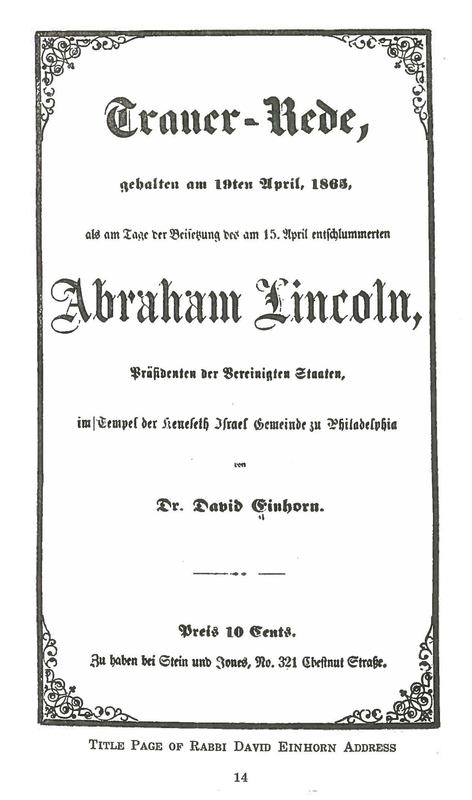 The first laid the foundation stone for the great construction of the Republic, the latter set the capstone – which is Lincoln’s gravestone. For this reason, honor God and do not doubt that from this horrible night a glorious morning will break forth, that God’s purifying and glorifying love stands beside our lamentation of woe, a love which will adorn the one who blissfully sleeps in the beyond with the most glorious crown. Most glorious judge over life and death, all-powerful leader of the history of all nations! you have laid a hard, painful trial upon us! brighter than the vault of heaven, shining more gloriously than the sun upon our head – there you allowed the lightning bolt to descend thundering and terrible upon the son of the dawn, upon the savior and redeemer of our country! as you once took Aaron’s beloved children from him on his day of joy and honor, so have you allowed the chosen one to be snatched from us in the middle of the highest jubilation, have elected the priest of freedom to be freedom’s victim. But still we kiss your chastising fatherly hand, like Aaron, and bow in deep humility before your unfathomable wisdom, in unshakeable trust that you will also lead our people through this terrible trial to victory and triumph, through this dark night to the bright morning. You have not cast us away, but purified us; you wanted to cleanse this land of the hideous black stain that darkened the light of your freedom, and you have washed this stain away forever with the noble blood of the one beloved by you and us. Oh take him graciously to your fatherly heart, that pious, patient sufferer, who breathed his last in fighting for you and, in your higher sanctuary, let him partake of all the blessedness that you have preserved for your loyal devotees. Pour the soothing balm of consolation in the deep wounds of his mourning family, of his entire people, which calls after him, having ascended to heaven, in unspeakable woe: my father, my father! O God, let his spirit be passed on to his successor, as the spirit of Elijah, gathered in a whirlwind, was passed on to Elisha, so that he might happily consummate his great work and arise, with doubled strength, against the worshippers of Baal – so that the serpent could no longer destroy upon Your holy mountain and that the long-awaited peace would soon be upon us! Once, Abraham wanted to sacrifice his beloved son to you – here the children bring you their sacrificed father Abraham with broken, but humble hearts. But let salvation arise from our tears, and permit the gifts we now donate in memory of the beloved for our heroes of freedom and their bereaved families! Amen. And now, beloved friends, let us give these gifts! We could no better honor the memory of the one who has gone to sleep than by offering sacrifices upon the altar of the fatherland for our freedom-fighters and their widows and orphans. The mosaic law demands: if the body of a slain one is found, and the murderer has not been apprehended, a sacrifice shall be offered, because the national community feels tainted and in need of atonement. We find ourselves in the same situation, and to dry the tears of those who shed their blood for us – let these be our sacrifices! Thus, each will gladly make a contribution, for we must honor his martyrdom – kiddush hashem  – and must honor him, who also protected us as Israelites and embraced us with a loving heart. Written as Isaiah 21:11 in the original but it appears to be 21:12. Possible reference to notorious Confederate guerilla fighter Champ Ferguson. “Holy mountain” is a reference to Isaiah 11:8–9. Sanctification of the Holy name. American Jewish Archives. Translation by Alisa Rethy. Use of this item for research, teaching and private study is permitted with proper citation and attribution.